With over 1,200 members, the San Antonio Hispanic Chamber of Commerce is extremely involved in their community. From hosting networking events to providing education and keeping the business community updated on the latest news, they have a lot of things to communicate to their audience. A variety of custom email templates allows their email marketing to be organized, aligned with their brand, and directed to the right segment of their audience. While SAHCC’s members all have one common focus, they are a diverse group with different challenges and goals. Subscription topics allow each member to customize what content they are receiving. 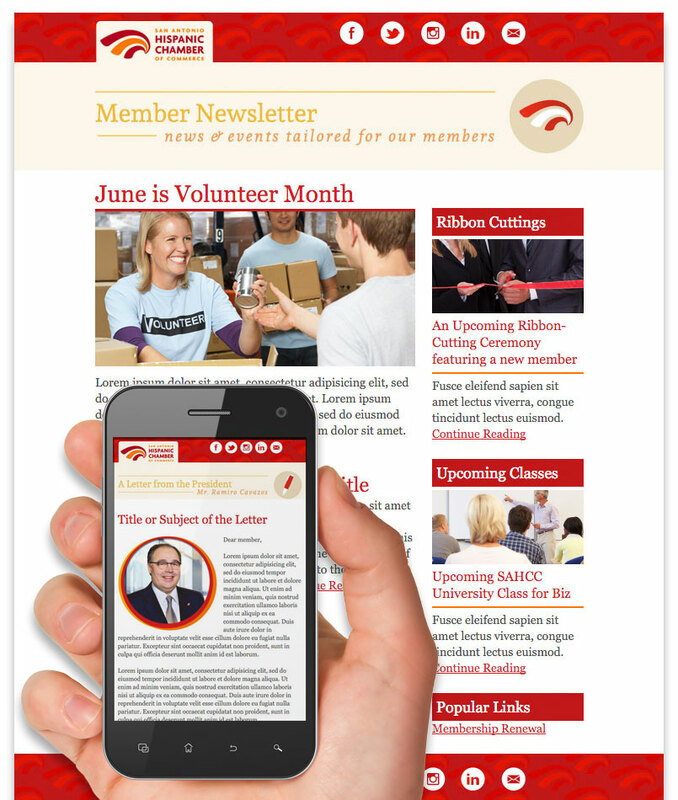 While every member receives the weekly newsletter or messages from the chamber president, topics like education, events, news, or membership opportunities are optional. Because there is so much information and many happenings, it ensures that each member is only receiving the content they are interested in hearing about. A separate template was customized to organize various topics. Each template is custom-coded to adjust to any screen width – mobile, desktop, or tablet. The topic is displayed prominently at the top of the email to allow the viewer to become familiar and accustomed to the content they receive on a regular basis. The templates not only allow for a recognizable layout for the viewer, but also are easily utilized by the Hispanic Chamber staff. With the ability to add their own images, content, and links through the simple user interface, they can add as much content as they want. 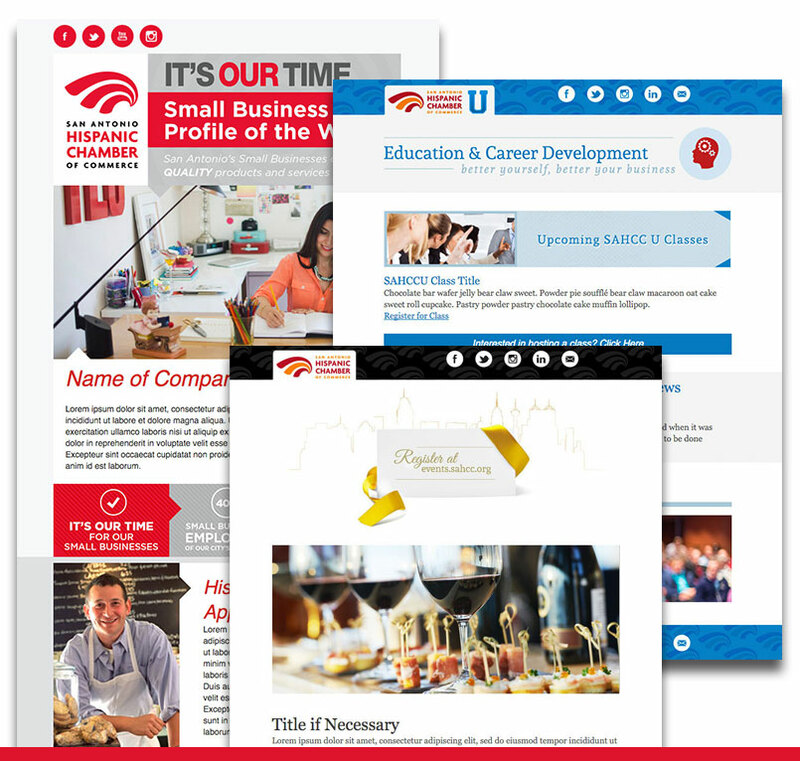 Since implementing their new email marketing strategy, the chamber’s staff has been busy sending well over 150 emails their subscribers and are continuing to keep their email game strong. They have even increased their total subscriber list by over 19%! They continue to grow their subscribers through word-of-mouth and their networking events. Vuepoint is a proud member of the Hispanic Chamber and we’re excited to be the go-to for their digital marketing needs. Check out the other projects we’ve completed to help them continue engaging and growing their organization.